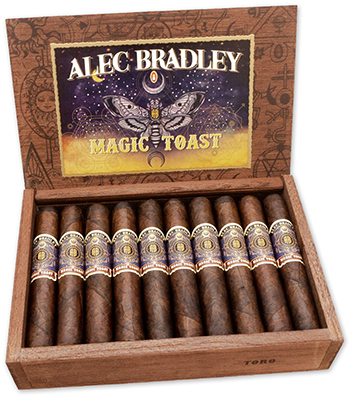 Alec Bradley owner Alan Rubin said Magic Toast's name was derived from an "almost magical" experience viewing a tobacco field in the middle of the night with a flashlight, which prompted him and his colleagues/business partner to grab a bottle of spirits and make a toast to the company's future. In fact, the magical tobaccos from that Honduran field play a prominent role in Magic Toast's unique blend. Handmade at Fabrica de Tabacos Raices Cubanas S. de R.L. in Danli, Honduras, these beautifully constructed, medium- to full-bodied premium cigars use filler leaf from Honduras and Nicaragua double-bound in leaf from these same countries and are finished with a dark Honduran wrapper. Magic Toast cigars are rich, well balanced, and magically delicious with notes of spice, earth, wood, nuts, and a natural tobacco sweetness.